Space saver rack safely stores your hair dryer and curling irons. Keeps counter space clear and prevents accidents. 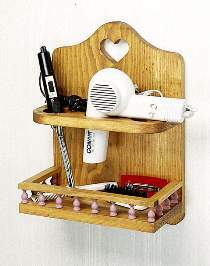 Handy lower shelf stores hair brushes and combs. Patterns drawn FULL SIZE. Measures 11"W x 16"H x 6-1/4"D. Project requires 14 each #S1 galley spindles.